A dried deep reddish brown chile pepper about 3 inches wide and 4 inches long with a sweet hot flavor. When fresh they are referred to as poblanos. Anchos are flat, wrinkled, and heart shaped. The ancho is the sweetest of the dried chiles; and is most commonly used in authentic Mexican cooking and is a staple in red chili and tamales. The Ancho Chile together with the Mulato and Pasilla chiles form the "holy trinity" of chiles used to prepare mole sauces. 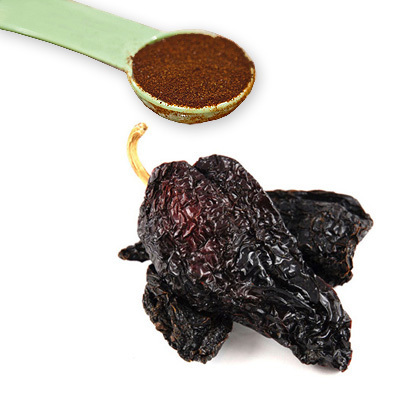 Ancho is used to add flavor, heat, and color to sauces and moles. Anchos are mild to moderately hot and often soaked and ground for use in sauces.